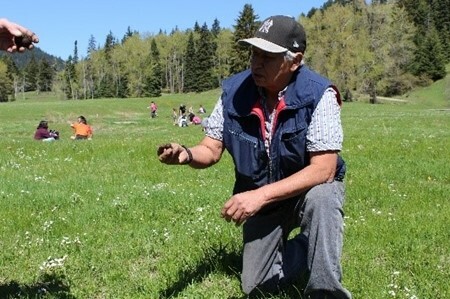 Through funding from the Nlaka’pamux Trust, the Citxw Nlaka’pamux Assembly has established a strategy for the revitalization of Nlaka’pamuxcin. This includes language labs and sessions at Participating Band communities, language lessons with Nlaka'pamux Elders, traditional storytelling, as well as language and cultural conferences and gatherings. Knowledge of Nlaka’pamuxcin has slowly eroded and, largley because of the Residential School experience, many generations of the Nlaka’pamux people have lost the ability to speak the language fluently. The team selected to bring this initiative to the Nlaka’pamux communities consists of Jean York, Kelli Lacerte, Lena Nicholson and Mary Angus. This team develops the language learning curriculum which is available and promoted to CNA Participating Bands. The main goal of the team is to design and enhance language learning through use of the CAN 8 system. This enables the learner to listen to a recording of an Elder or Nlaka’pamux speaker as well as see a visual of the recording on a computer screen. The learner can then record their own voice and compare it with the speaker’s voice. In addition to words and phrases, the curriculum also includes stories, songs, and other cultural teachings emphasizing the oral aspect of the language. The process of developing this resource will continue indefinitely. The goal is to bring Elders and fluent speakers together to talk about Nlaka’pamuxcin to revive forgotten words and “invent” new ones to expand the dictionary. The team also provides support for traditional and land based learning activities such as gathering, fishing and hunting. Finally, to use new and unique ways to improve language retention and to encourage community members join in this exciting new journey. All of the equipment necessary to support the language program will be provided by CNA. "To maintain or renew a language is a never-ending task since each generation has the potential to either transmit the language or let the language die. It is only the speakers of the language who can save it and who either care enough to pass it on or decide to let it pass away."